This is getting ugly. 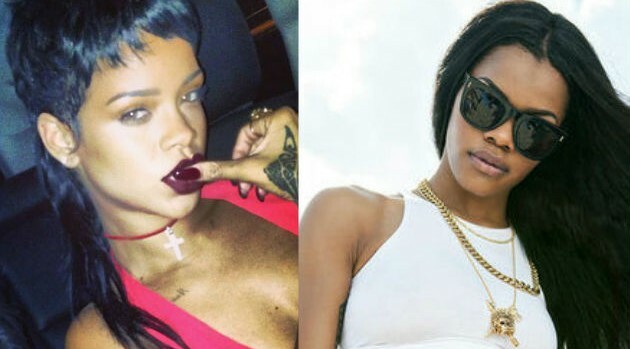 Following the recent Twitter spat between Rihanna and Teyana Taylor, fans of the women have launched dueling petition drives seeking to get the women’s corporate partners to drop them. First, Rihanna‘s fans started an online petition requesting that Adidas rescind Taylor’s endorsement deal, accusing the G.O.O.D Music singer of making light of the fact that Ri Ri was the victim of domestic abuse. In the midst of their feud, Taylor changed her Twitter header to an image of herself as a boxer, hitting another boxer whose face has been replaced with the superimposed image of a battered Rihanna, after she was assaulted by then-boyfriend, Chris Brown, back in 2009. In response, Teyana’s fans have launched their own petition asking MAC Cosmetics to drop it’s partnership with Rihanna because of what the petition terms her constant cyber-bullying. The campaign suggests the “We Found Love” singer is “using her platform in a very negative light and does not provide a positive image for MAC cosmetics or any of the other companies that she endorses.” So far, more than 380 people have signed the petition. The social media cat fight started earlier this week when the Roc Nation star posted a parody video of her male hairstylist, Yusef Williams, mocking Taylor, who posted a video on Instagram of herself singing “Caught Up in the Rapture” nearly two weeks ago.